New members have joined the Board of Directors in 2018-2019. Board meetings are held on the third Monday of each month, in the gallery. We welcome you to attend these meetings and learn how the organization functions. 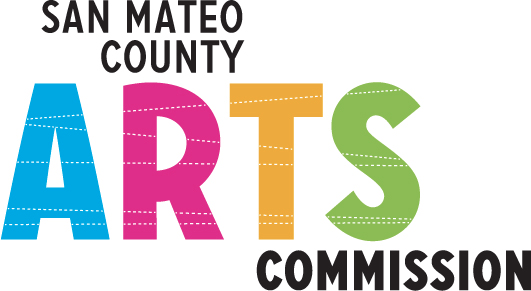 Please thank the board members for their contributions to ensure that CAL will remain a strong and resilient Arts and Culture organization on the Coastside. ​​Jane Lewis continues in a third year as President. She is a California Educator, BS, University of California, MA San Diego State University, with 28 years of service to the San Diego Unified School District, as a Resource Specialist and Staff Developer, as well as an English, Journalism, and Reading teacher. ​With the help of many volunteers, Jane has coordinated exhibitions in the Decker Gallery for a third year. She also serves as website administrator and writes the Constant Contact Bulletin each month. Patricia E. Keefe is an alumnus of the University of San Francisco, where she received her B.A. in Art. She earned an M.A. in Sculpture and fine Arts from San Jose State University. Pat also earned a Master in Art Therapy from Notre Dame de Namur University. 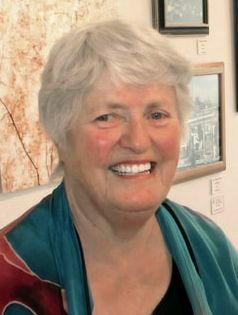 She has been a Board member of the National Paint Brush Diplomacy.org, co-founder of the Peninsula Sculpture Guild, and past president of the Coastal Arts League. She continues to be actively involved with The Sculptor's Guild, and The Women's Caucus for Art. She is a member of the Artists Collective where she displays sculpture and watercolors. Jewelry artist, Betsy Harms coordinates the Gallery Host Calendar. Stephen Renwick, a photographer, serves as Recording Secretary. He brings experience from other volunteer organizations and from his current management position at Nikon Research in Belmont. Steve is a film photographer, and has curated two shows at CAL in 2018.​ Steve's photos of artists' receptions often appear here, on CAL's website. Thomas Goodson, Treasurer, has 39 years of management and executive experience in the pharmaceutical industry. He has guided several new drugs through the approval process in the U.S., Europe, Australia, and Japan. He is also a silversmith whose jewelry work can be seen in the Artists Collective gallery store. Susan Vandiver chairs the Advisory Board, comprised of Patti Appel, Bonnie Dunham, Jennifer Almodova, and Priscilla Klass, and Patricia Keefe. Susan also serves on the Board of the Coastside Adult Day Health Center. Retired from social work and non-profit executive duties, Susan is a watercolorist, and travels extensively with her husband Leland. Patti Appel is recently retired from The College of San Mateo, as Professor in the Graphic Arts Department. She studied at Santa Clara University and UCLA, where she earned her MFA in Theatre Arts and Acting. She has been involved for many years with the Coastal Rep. in Half Moon Bay. Susan Vandiver points out her show entry. Linda Rutherford joined the board in mid-2018, to fill out the unexpired term of Vice President. She has an MBA in Finance, 20 years in Senior Management of major financial companies focusing on Marketing of New Products, 12 years experience in real estate property management, and several years experience as a Board Member of various non-profit organizations. Her photography is displayed in the Artists Collective gallery store. Anne Grauzlis is the site liaison for the Art Outreach program for seniors. She maintains a glass display case for art in the Senior Center lobby. Anne is a retired business owner, of a horticulture and landscaping business. She enjoys making beaded jewelry, and serves as Gallery Host two days each month. Her work has been exhibited at Artifact Gallery (NYC), ArtBlend Gallery (Fort Lauderdale,FL), and Watermill Museum (Hamptons, NY). Since 1991, Jennifer Roberts Almodova has taught Fine Arts at the San Francisco Academy of Art. She has developed online courses in Graduate Color Theory and Watercolor painting. she lives on the Coastside and has taught many local art classes and workshops. Cheryl Costella, Curator and Gallery Store Liaison, is a painter in oils, and has been a member of the Artists Cooperative Gallery Store since March 2017. 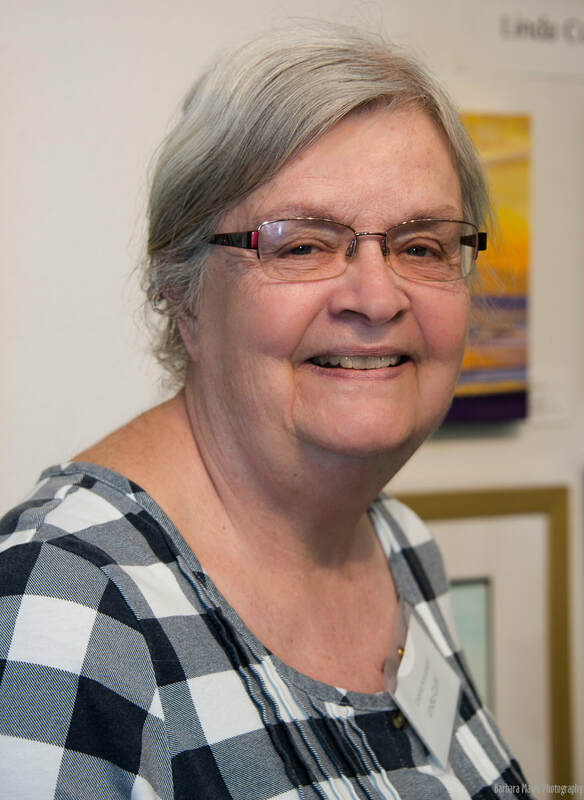 A long time resident of Ben Lomond, she is also a member of the Santa Cruz Mountains Art Center in Ben Lomond, has served on their Curatorial Committee and as Curatorial Chair on the Board of Directors. Priscilla Klass has done mural work for clients, such as Gallo Winery corporate offices, Teichert Construction, Ritz-Carlton HMB, and Stanford Medical Clinics. Her work has also been exhibited in Bay Area galleries for many years. She continues to do commission work and teach private art classes. Bonnie Dunham is retired as Superintendent of La Honda Pescadero Unified Schools. She has also served on the Half Moon Bay City Council and Chamber of Commerce. 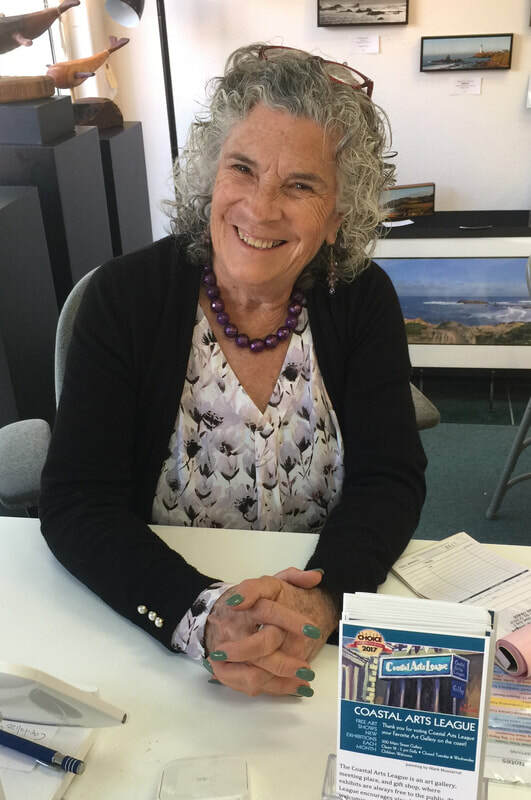 She participates in the South Coast Artists' Alliance, and shows her photography at the annual Pescadero Art and Fun Festival. What's in our Organizing Documents? The Coastal Arts League was organized in 1980 for the specific purpose of encouraging the creative arts in the community, through educational presentations, workshops, exhibits, and publications. The Coastal Arts League is a charitable organization under 501c3 IRS regulations. In California, it is regulated as a non-profit, by Assembly Bill 1233. Our by-laws specify that all current dues-paying members are eligible to vote for the board of directors, elected annually. Committee chairs are appointed by the president to serve on the board, and board positions have two-year term limits. Our fiscal year is January 1 to December 31. Our mission is to support the visual arts in the region, providing opportunities for artists to meet, show their work, and practice their art as part of a quality lifestyle. By tradition, we are an artists’ cooperative. This idea provides intrinsic reasons for our organizational goals and objectives. We are a volunteer organization, where members can find a way to participate according to their interests. We have much to celebrate, including our generous members. Annual Donor letters, required by the IRS, were completed in January 2018 and 2019. Additionally, fifty-five donors contributed during the Spring 2018 Fundraiser, Coastside Gives. CAL is again participating in the Spring fundraiser in May 2019. The annual Members Show begins in early December, and continues through the New Year. All who join or renew their membership by November 30, are eligible to participate. ​At our Mid-year Evaluation in July 2017, the Board voted increases in membership dues and exhibit fees. Those changes were implemented with the November Membership Renewal campaign. Beginning in January 2018, the Exhibition Gallery fee was increased to $400/week. Thirteen shows were launched in the Decker Gallery in 2018, and the same number are underway for 2019. New members have been added to the Artists Collective, and sales increased in both galleries during 2018. Juried shows elevate CAL’s reputation and promote artists. Jurors are regionally known professional artists and teachers, and participation can be listed on one’s artist statement or resumé. Three juried shows provide opportunities to artists in all media areas to compete for prizes. ​​In 2019, a full schedule of 13 exhibitions is underway. ​​13 shows per year, with public receptions, attract a wide variety of visitors. Participating artists are expected to promote shows to their own contacts. We advertise shows to our mailing list, which grows gradually through sign-ups on this website. ​​We are now scheduling shows for 2020. The Artists Collective Gallery Store provides a shop on Main Street in Half Moon Bay, where artists can rent space for as little as six months. The members serve as gallery hosts, representing the artists in the Decker Gallery as well. So the value of the Artists Collective includes rents paid for space, staff time, and sales commissions. We receive 20% commission on sales in the Artists Collective Gallery, which helps artists to keep their prices reasonably low. Fresh paint and additional lights make a more attractive space. We anticipate that new members in the Artists Collective will bring the number to 20 in 2019. Bi-weekly after-school art classes provide activities for K-5 children at the Mid-Peninsula Housing's Main Street Park Apartments. Weekly art classes for adults at the Senior Center have developed a teacher cadre, and a curriculum, with art supplies provided by CAL.